Joinville-le-Pont Communal Cemetery is three miles South-East of Paris. 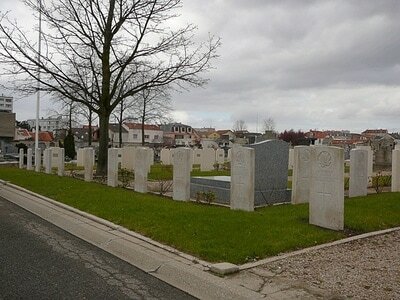 The 6th Canadian General Hospital was at Joinville-le-Pont in 1918-1919, and Division 13, contains the graves of soldiers and airmen who died in those years. There are now 14, 1914-18 war casualties commemorated in this site. 18th February 1919, aged 22. INSCRIPTION. WITH TENDER HAND AND BENDED HEAD THEY LAID HIM IN A HERO'S BED. Son of Frederick and Sarah Lemon Bowers. Born at Charters Towers, Queensland. Studio portrait of 4264 Private (Pte) Albert John Llewellyn Bowers, 11th Reinforcements, 31st Infantry Battalion. 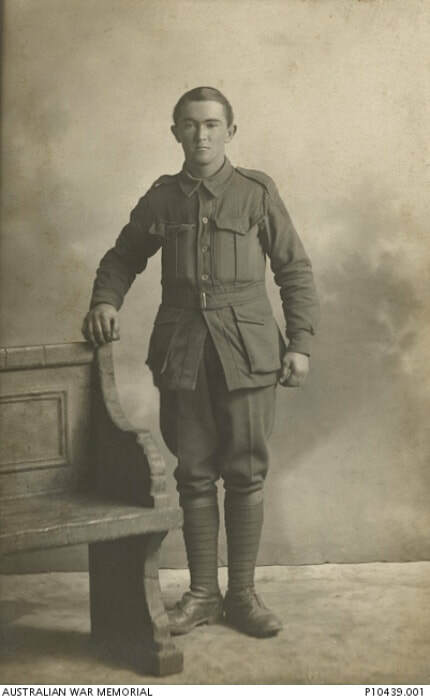 A bootmaker from Charters Towers, Queensland, Pte Albert Bowers enlisted on 13 July 1916 serving in the same battalion as his brothers, 4158 Pte Charles Victor Bowers and 4265 Pte Robert Bowers. 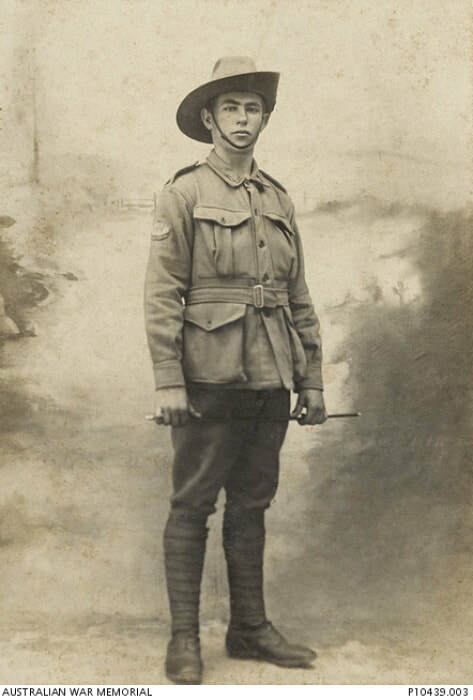 Pte Albert Bowers died of influenza in France on 18 February 1919 aged 22 years. Studio portrait of 4158 Private (Pte) Charles Victor Bowers, 10th reinforcements, 31st Battalion. 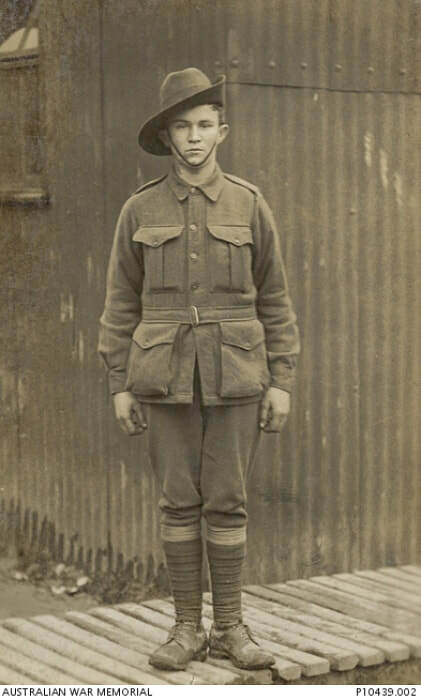 A labourer prior to enlisting, An Orphan by 1916, Pte Bowers was working as a labourer when he enlisted in Charters Towers, Queensland at 18 years of age. He was one of three brothers who served in the same battalion. Pte Bowers embarked from Brisbane on 21 October 1916 aboard HMAT Boonah. He encountered various difficulties during his service. On the journey to England, he was censured for 'Disobeying in such a manner as to show a willful defiance of authority, a command given personally by his superior officer'. During 1917 the three brothers were reported as absent without leave from their unit from 4-14 September 1917 for which they were punished with 10 days detention and the forfeiture of 20 days pay each. Pte Bowers also suffered from fits which caused him to be hospitalised several times and as a result he did not see action despite serving in England and France until 1918. He returned to Australia aboard the British Hospital Ship Dunluce Castle and was discharged on 24 April 1918 due to debility. 4265 Pte Robert Bowers was invalided to England on 24 August 1918 and returned to Australia where he was discharged on 1 April 1919. 4264 Pte Albert John Llewellyn Bowers died of influenza in France on 18 February 1919. 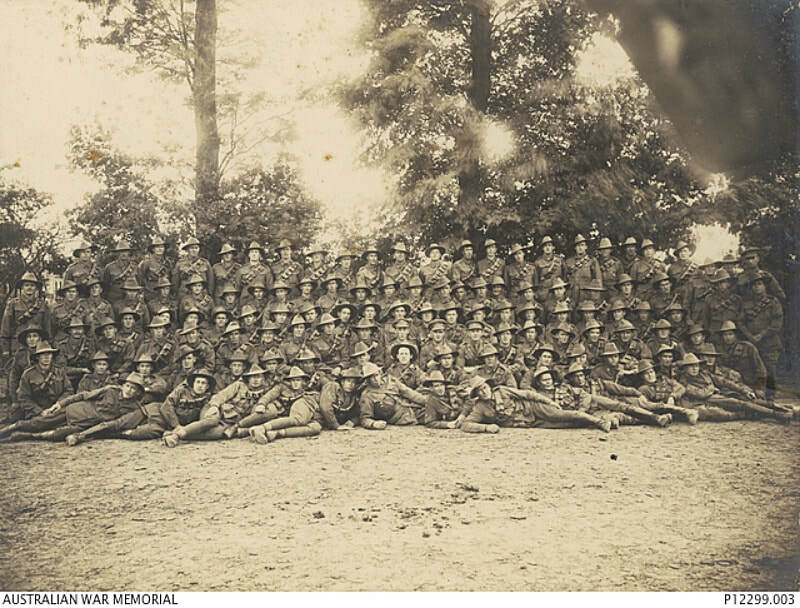 Group portrait of members of the 6th Field Artillery Brigade, 18th Battery taken during the period 3 July 1917 and 15 July 1917. Members of this Battery were awarded two Military Crosses (MC), one Distinguished Conduct Medal (DCM), one Meritorious Service Medal (MSM), sixteen Military Medals (MM), one Croix de Virtue Militara 2nd Class (Romania) and five Mentions in Despatch (MID). 26079 (SX22323) Gunner (Gnr) Leopold von Bertouch; 868 Gnr Thomas Dean; 27223 Gnr Wallace William Newell; 8379 Bombadier (Bdr) James Keith Murray, MM (later Bar); 10771 Gnr Archibald George Kirk; 8369 Gnr William Arthur; 8210 Driver (Dvr) John Henry Rivers Oldmeadow; 9481 Gnr Robert Findlay; 27257 Gnr John Vivian Frost; 8376 Bdr Eric Davies Sims; 29603 Gnr Rolon Hindes, (later MM); 30225 Dvr Victor Claud Sinclair Gross; 19756 Corporal (Cpl) Alfred Austin Howells; 10766 Gnr Samuel Louis Gordon; 10774 Dvr Albert James Masters; 8382 Dvr Francis William Daniel; 8437 Dvr Albert Edward Thomas; 1137 Gnr Albert Pankhurst (also known as Albert Lenthall); 6409 Gnr Leo Conroy Steminger; 8488 Gnr Clive Albert Boyce; 28376 Dvr Eric Spencer Scrivenor. 8356 Sergeant (Sgt) Horace Stanley MacGeorge; 8471 Gnr Henry Charles Harden, (later MM); believed to be 8479 Dvr John Gibson; 3174 Dvr Angus William McLean; 1248 Dvr William John Miller; 10762 Bdr Lancelot Carthew, (later MM); 8416 Dvr Herbert Walter Sorrell; 26896 Gnr Stanley Waterhouse; 8496 Gnr Henry Sinclair Bloch; 29786 Gnr Edgar Lindsay Stewart; 3308 Shoe/Smith Joseph Henry Shepherdson; 8472 Bdr Roby Frederick Marchant, MM; 4750 Bdr Charles Patrick Melville; 8468 Gnr Harold William Edmonds; 9037 Dvr Fred Stewart Webb, died of disease 15 August 1918; 8414 Dvr John Harry Bridgman; 8423 Dvr Walter James Forbes Sage, (later MM); 9134 Dvr Felix Anderson McCarron; 11367 Gnr Maurice Matthew Murray; 26499 Dvr John Hackett; 28102 Dvr Angus Johnston Murray; 1506 Dvr Bertram Olrich; 8357 Farrier Sgt George Ebenezer Shepherdson; 8491 Sgt Herbert Hector William Gaylard (also known as Gayland); 29872 Battery Quartermaster Sergeant Jack Eric Christiansen. 8380 (SX12762) Bdr Edward William Mattner, (later MC DCM MM); 9069 Corporal (Cpl) George Robert Sandaver (also known as Sandover); 12180 Gnr Albert Lindsay Cram; 8370 Gnr George Albert Capper; 30483 (Dvr Patrick Francis Lacy, killed in action 25 September 1917; 8378 Gnr Lawrence Ernest Wundenburg Schmidt; 8444 Dvr Arnold Henry Jefferson Storer, (later MM); 10779 Gnr John Henry William Pew; 26463 Gnr John McCusker; 9467 Gnr Cyril Barkly Apperly, killed in action 7 November 1917; 8351 Cpl Clifford Edmund Kendle; 8487 Gnr Hercules Orlando Herbert Thompson; 8624 Dvr Norman Syrette; 8391 Dvr Harold Roy Gray, (later MSM); 8421 Dvr Eric John Pryor; 12212 Gnr Richard John Nelson; 8652 Dvr Peter Ferns MacDonald, killed in action 26 September 1917; 25828 Dvr Allen Dunstan Symons; 10766 Gnr Samuel Louis Gordon; 25832 Dvr Charles Andrew Peace; 8426 Gnr Lawrence William Carr, killed in action 26 September Sep 1917; 1360 Dvr Neil James Thomas Pickett; 399 Gnr Kenneth Cook; 12374 Gnr Edward Leonard Nenke; 1051 Sgt Frederick Batten, (later MM). 8374 Gnr Herman Roy McPherson; 8371 Dvr Christopher Berryman; 8477 Dvr Sydney Charles Harper, died of disease 11 November 1918; 2860 Gnr John Webster Gaylard, (later MM); 1563 Gnr Louis Bertrand Cunneen; 8396 Dvr James Randell Eddy; 8394 Dvr Garnet Leopold James Boase; Second Lieutenant Walter Stanley Scrivenor; Lieutenant (Lt) Lawrence Joseph West, (later MC); Lt Basil Beaufort Brett; 2898 Gnr William Allan Singleton; 8418 Dvr Waldin William Forrest; 15016 Gnr Percival Gilmour Farmer; 8402 Dvr William Gillingham Caudy (Candy) Murdock; 27014 Gnr David Colin Sharp; 5589 Gnr Ian Malcolm Leaper; 8389 Dvr Coleman Roy John Evans; 3778 Dvr Herbert Hollier. 1524 Gnr Albert Edward Cole; 8411 Dvr Rupert Lindsay Willshire; 15029 Dvr Walter Sydney Webb; 9499 Gnr Claude Agustus Gordon Sharf; 8406 Gnr Arthur Lewis Bodholdt, killed in action 26 September 1917; 8413 Dvr Charles Wood; 1549 Gnr Jonathan Fleming Robert Boadle; 9515 Gnr Alfred Henson, killed in action 26 September 1917; 8390 Bdr William Cliff Chambers, (later MM and Bar); 9509 Gnr Harold Parncutt; 8419 Dvr William Smith, (later Croix de Virtue Militara 2nd class (Romania)); 1689 Bdr Ferguson Weale Boadle; 10432 Gnr Charles Jary; 26277 Dvr Maurice Henry Mitchell, died of wounds 15 August 1918; 3696 Dvr David Gordon Burr; 26729 Dvr Miles Alexander Monk. 12896 Gnr Thomas Edward Gleeson; 8475 Dvr Albert George Antill; 9574 Gnr Walter White; 8486 Gnr Jack Vincent Wallace, died of wounds 3 August 1917; 8360 Bdr Marshall Albert Cocker, (later MM); 8346 Sgt Douglas Malcolm Niemann; 8361 Bdr Doric Dudley Bradbury, (later MM); 1438 Dvr William Knight; 8476 Dvr William David Edwards; 21146 Dvr George William Nunn; 10031 Gnr Thomas Edward Finley, (later MM); 9463 Staff Sergeant Sydney Alfred Robinson.